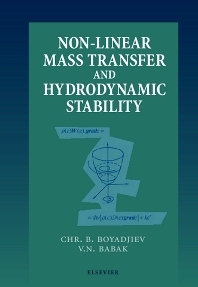 Surveyed in this book are the kinetics of non-linear mass transfer and its effects on hydrodynamic stability in systems with intensive interphase mass transfer, in electrochemical systems with high current density and in chemically reacting systems. In Part 1 the non-linear mass transfer as a result of an intensive interphase mass transfer in the gas (liquid)-solid surface, gas-liquid and liquid-liquid systems is considered in the duffusion boundary layer approximation as well as in flat channel taking the longitudinal diffusion into account. The influence of the direction of the intensive interphase mass transfer on heat transfer and multi-component mass transfer is illustrated. Part 2 discusses non-linear mass transfer in electrochemical systems with high current density using the examples of the anode dissolving of metals in the electrolyte flow and the electro-separation of metals out of concentrated solutions. The theory of the measured electrochemical treatment of metals and alloys, which is a method of wide practical use, has been elaborated on this basis. In Part 3 the non-linear mass transfer in chemically reacting systems is considered in the cases of: non-linearity of the equations of the chemical reaction's kinetics and intensive interphase mass transfer or thermo-capillary effect due to chemical reactions. On this basis, the mechanisms and the macro-kinetics of the chemical transformations in the gas-liquid systems are discussed. Part 4 is dedicated to the chemical reaction kinetics in stationary two phase systems at an arbitrary contact time between phases. In Part 5 the effects of concentration gradients are considered in the approximations of the linear theory of the hydrodynamic stability of almost parallel flows. In systems with intensive interphase mass transfer, the Marangoni effect could also be observed, beside the effect of non-linear mass transfer. A comparative analysis of both effects is made in this book. For scientists conducting research in the areas of chemical engineering, biochemical engineering, fluid mechanics, thermophysics and heat and mass transfer. Preface. Introduction. Linear Mass Transfer Theory. Model theories. Boundary layer theory. Immobile phase boundary. Moving phase boundary. Counter-current flow. References. PART 1: Systems with Intensive Interphase Mass Transfer. Specifics of the Hydrodynamic Conditions of the Intensive Interphase Mass Transfer. Influence of the intensive interphase mass transfer on hydrodynamics. Boundary conditions of the non-linear mass transfer problem. Gas (Liquid)-Solid System. Non-linear mass transfer in the boundary layer. Heat transfer in the conditions of non-linear mass transfer. Multicomponent mass trasfer. Non-linear mass transfer in the entrance region of a channel. Gas-Liquid and Liquid-Liquid Systems. Non-linear mass transfer in the gas and in the liquid boundary layer. Multicomponent interphase mass transfer in the case of an intensive mass transfer in the gas. Non-linear interphase mass transfer between two liquids. Gas-Falling Liquid Film-Solid Surface System. Non-linear interphase mass transfer between the gas and the falling liquid film. Non-linear effects in the case of a multicomponent interphase mass transfer between the gas and the liquid film. Effects of Concentration and Temperature on the Non-Linear Mass Transfer. Concentration effects. Influence of the high concentration on the mass transfer rate. Non-linear mass transfer and Marangoni effect. References. PART 2: Electrochemical Systems with High Intensity Electric Currents. Fundamentals of the Kinetic Theory of Transport of Mass and Charge in Electric Systems. Method of the self-consistent field. Transport of neutral molecules in the self-consistent field of the double electric layer. Method of the local thermodynamic equilibrium. Anodic Metal Dissolution in an Electrolyte Flow. Dissolution of surfaces equi-accessible with respect to the ionic mass transfer. Ionic mass transfer due to an anodic dissolution complicated with a reaction of complex formation. Comparison between the theoretical predictions and the experimental data. Ionic mass transfer effects on the hydrodynamics during dissolution of a rotating disk electrode surface. Anodic dissolution of metals in concentrated solutions with variable physical properties. Effect of saturation of near-anode layer by electrode reaction products. Electrochemical dissolution of metal inclusions in channels. Dissolution of rectangular channel walls. Electrochemical Recovery of Metals from Concentrated Solutions. Method for the establishment of the effects of the apparent diffusion coefficient of the salt. Effect of the Non-Isothermal Conditions and the Gas Evolution. Non-isothermal effects on potential distributions in an injection flow electrochemical cell. Gas evolution. References. PART 3: Chemically Reacting Gas-Liquid Systems. Interphase Mass Transfer Mechanism. Irreversible chemical reactions. Homogenous catalytic reactions. Reversible chemical reactions. Relationships between the chemical and physical equilibriums during absorption. Macrokinetics of the Chemical Transformations. Chemosorption in a falling liquid film. Sulphuric acid alkylation process in a film flow reactor. Non-linear mass transfer in a falling liquid film. Effects of the Physical Parameters. Concentration effects. Temperature effects. References. PART 4: Non-Stationary Interphase Mass Transfer with Chemical Reactions. Non-Stationary Physical Absorption. Problem solution. Solutions at short contact times. Interphase mass transfer resistance located in one of the phases. Solution on the line ß = 1. Solution in the upper part of X - Y plane. Solution in the lower part of the X - Y plane. Solution in the left part of X - Y plane. Solution in the right part of X - Y plane. Numerical solutions. Approximations of the numerical solutions. Physical absorption. Non-stationary interphase heat transfer. Interphase heat transfer regimes. Non-Stationary Two-Phase Absorption Complicated with First Order Chemical Reaction. Solution in X-Y plane at &egr; << 1, &egr;ß << 1. Solution in the area with &egr; >> 1, &egr;ß << 1. Solution at &egr; >> 1 and &egr;ß >> 1. Solution in the area with &egr; << 1, &egr;ß >> 1. Solution at ß2 = 1. Common properties of the solutions. Numerical investigation of the two-phase chemosorption in the initial time interval. Numerical investigation of the chemosorption outside the initial interval. Methodology of the chemosorption design. Non-Stationary Absorption with Second Order Chemical Reaction. Mass transfer in the liquid at the short contact times. Transformation of the problem of two-phase chemosorption to a two-phase absorption problem with non-linear boundary conditions. Solution with parameters &egr; N < 1, &egr; ß N < 1. Solution with parameters &egr;N > 1 and &egr;ßN > 1. Investigations in the fourth quadrant of the plane XN-YN. Investigations in the second quadrant on the plane XN-YN. Analysis of the basis relations of the two-phase absorption. Applications. References. PART V: Hydrodynamic Stability in Systems with Intensive Interphase Mass Transfer. Stability Theory. Evolution equations. Bifurcation theory. Eigenvalue problems. Hydrodynamic Stability. Fundamental equations. Power theory. Linear theory. Stability, bifurcation and turbulence. Stability of parallel flows. Orr-Sommerfeld Equation. Parallel flows. Almost parallel flows. Linear Stability and Non-Linear Mass Transfer. Gas (liquid)-solid system. Gas-liquid system. Liquid-liquid system. Gas-liquid film flow systems. Effect of concentration. Effect of temperature. Mechanism and Kinetics of the Transport Processes in Systems with Intensive Interphase Mass Transfer. Mass and heat transfer kinetics. Linear stability analysis. Comparison with experimental data. Comparative analysis of the absorption and desorption rates. References. Conclusion. Index.